It’s not much of a secret — Holland Taylor loves Ann Richards. And it’s little wonder why: the former governor of Texas who died in 2006 was a larger-than-life personality, a political pioneer and a beloved national figure. Ann, which previously played in theaters in Texas, Chicago and Washington D.C., is Taylor’s passion project — the culmination of four years of research and writing. Taylor is the leading woman in the show, her first as a playwright. Now in New York, under the direction of Benjamin Endsley Klein (who has been with the show since its early days), the love still shows — with mixed results. On one hand, Taylor — a veteran stage, television and film actress perhaps best known recently for her role as the overbearing mother in Two and a Half Men — is a dead ringer for Richards. Her character has the same witticisms, the same foul mouth, and the same undeniable warmth of the woman herself. And on stage, Taylor nails the accent, the look and the brassy Texas ‘tude. Richards is a natural role for Taylor, who has built a career on similarly strong, type-A characters. It’s a studied and remarkably authentic performance. And Taylor’s shtick is charming enough to entertain for a full two hours. But Taylor — who has proven equally proficient at comedy and drama in the past — hovers uncertainly and never quite convincingly between the two in Ann. After recreating Richards’ now-classic 1988 Democratic National Convention speech, the play opens as Richards delivers an imagined college graduation speech. Addressing the audience directly, Richards tells a bit of Texas history, tales from her upbringing, and early experiences in California that laid the foundation for her “passion for simple fairness,” among other anecdotes. Projections by Zachary Borovay during Richards’ initial monologue do little to enrich the on-stage aesthetic or add meaning. And the occasional sound effects — a strange whirring sound, for instance, when Richards mentions a crystal ball — are confusing if not entirely negligible. Richards teases and winks as she totters across the stage like an aged stand-up, sometimes nearly keeling over with laughter at her own jokes. Liberal New York theatergoers are a receptive audience. What all this adds up to, though, is likely not all too different from one of Richards’ real-life stump speeches or public appearances. Her road to power and success seems like an inevitable upward trajectory — and she comes off like a saint. The portrayal is virtually uncritical. As a result, like many lovingly drawn valentines, Ann is virtually one-dimensional. While the script does acknowledge some of the bumps in Richards’ life — a failed marriage, and a battle with alcoholism, for starters — they are rendered near invisible through the show’s rose-colored lens. Only a few times, when discussing her parents or a strongly felt political position, does Richards reveal her softer, more emotional side. For the most part, Taylor’s performance essentially remains on that same dramatic plane — alternating between raucous humor, steely determination and wise reflection. Speaking from beyond the grave, Richards seems entirely at peace with her life and legacy. When, early on, Richards talks about her mother’s “no crying over spilt milk” philosophy, she might as well be describing her own outlook on the next couple decades of her life. Losing a second term to George W. Bush? What will be, will be. Growing up in an age of gender inequality? It was what it was. It’s not historical revisionism, necessarily. Richards may very well have felt this way. But as a playwright, Taylor had the license to stray from the official record and dive deeper. She passed it up. Our peek into Richards’ gubernatorial office halfway through the production does little to deepen our insight. At this point, Richards drops her speech, and, it would seem, her awareness of the audience, as she goes about a typical day in her hectic life. But the day’s events are not especially revealing. Richards takes phone calls from President Bill Clinton and her children and worries about an unfinished speech all while barking over the phone to an off-stage secretary (Julie White) — a convenient straight man to the frenetic Richards. Is the intent to show us Richards’ ceaseless work ethic? Reveal her managerial prowess? Hint at some sacrifice of a personal life? It’s not quite clear. It’s a rare life that can be wrought with meaning from start to finish. By jumping from childhood, to political life, to retirement, we see Richards only in broad strokes. Richards may have had an interesting life, but consuming it all in one gulp has the same effect as eating a meal too quickly. We miss the finer moments that might have brought greater satisfaction. Later, we’re shown a bit of Richards’ life after she loses re-election, but it’s more of the same. We’re given about two hours with Richards in total, but it feels like we don’t really learn much. It seems we are simply meant to revere the woman. That’s arguably a worthwhile mission in its own right, but a more thorough character study could have been achieved. Richards might have appreciated the honesty. “Ann” is currently running at the Vivian Beaumont Theater located at 150 W 65th St., New York, NY 10023. Tickets range from $75 – $125 and can be purchased at the Vivian Beaumont Theater box office, online at lct.org or through Telecharge.com (212-239-6200). 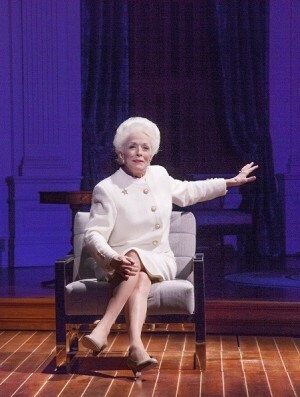 Featured image: Actress Holland Taylor stars as American politician Ann Richards in the Broadway production of “Ann,” written by Taylor and directed by Benjamin Endsley Klein. Photo Courtesy of The Hartman Group.